In every SAP SRM developer’s life there comes a day when he/she needs to modify the standard Web UI and this blog is intended for that day. Let’s get into the details now. Sounds like a piece of cake. Isn’t it?. Well not always. Let’s look at an example to understand it better. For instance, if you want to hide PO number field on overview tab of the PO screen. DATA : lo_trans_cont TYPE REF TO cl_wd_transparent_container. CONSTANTS lc_main_cont_id TYPE string VALUE 'MAIN_CONTAINER'. CONSTANTS lc_left_cont_id TYPE string VALUE 'LEFT_CONTAINER'. lo_trans_cont ?= view-&gt;get_element( lc_main_cont_id ). lo_trans_cont ?= lo_trans_cont-&gt;get_child( id = lc_left_cont_id ). IF lo_trans_cont IS NOT INITIAL. lo_trans_cont-&gt;remove_child( id = 'PO_NUMBER_LABEL' ). This method can be used , if the changes to the web UI applies to all the users. For this case, we will use the same BADI, but now we use the import parameter WD_CONTEXT, which holds the reference to the VIEW context. DATA lo_nd_attrib TYPE REF TO if_wd_context_node. DATA lo_nd_attrib_info TYPE REF TO if_wd_context_node_info. Add the field to the above configuration and select ‘Field enabled’ and ‘Field required’ check boxes as required. Same thing goes for fields at item level. You can define customer class and method to enable/disable fields based on custom logic. For more information on customer class, please refer to the SPRO documentation. 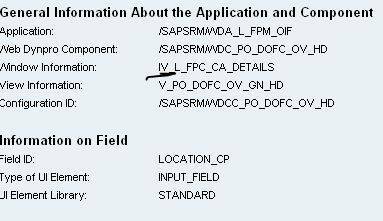 There is an excellent blog written by Ricardo Romero on how to add custom fields to SC and POWL. You can find the blog here Add custom field to SC and POWL. For adding new main views/Tabs, please refer to Floorplan Manager for WebDynpro ABAP: Dynamically Modifying Purchase Order FPM in SRM7 Using Custom AppCC. If you cannot achieve the requirement by any of the above said methods, the last option would be to enhance the standard webdynpro component/view. There might be other better ways of doing whatever I said above, so please post your thoughts and comments. I hope you enjoyed reading it as much as I did writing.